Oliver of San Francisco Pottery Girl with Basket Figurine. She appears to be singing with a basket in her arms. She looks European. She measures 5 3/8" tall. The condition is good. There are not chips or crackes but there is crazing. Although crazing is expected in the older pottery. Then on the edge of the basket there appears to be a blip of some kind. I think it is just a pinch mark in potter from the making of it and not damage that has been concealed. You will find my selection not only interesting & fun to browse through but very affordable too. Please email me if you have any questions. I am always eager to assist . 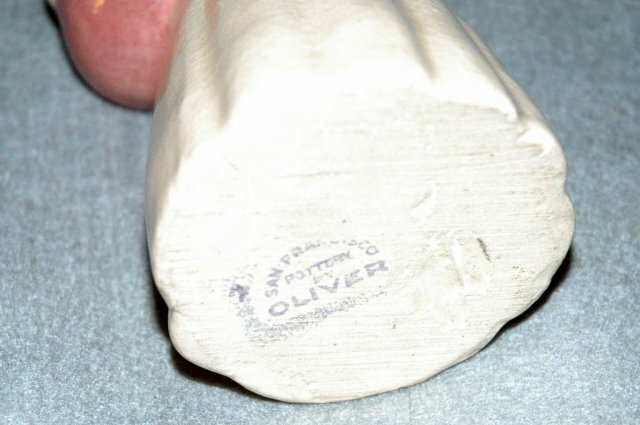 Items Similar To "Oliver of San Francisco Pottery Girl with"